Let’s unpack each of these problems one by one. The first sales tax was enacted in Mississippi in 1930 as a reaction to falling property tax revenues during the Great Depression. 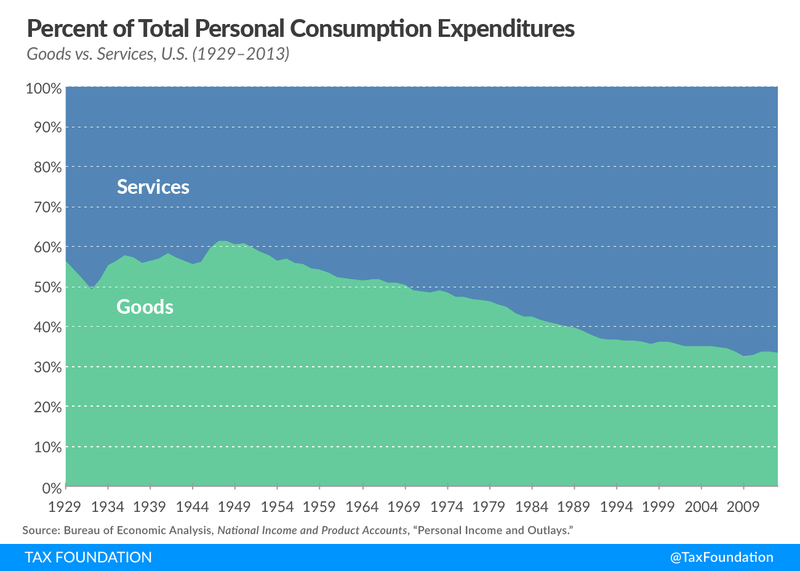 At the time, the consumer economy was predominantly transactions of goods. As a result, when the drafters wrote the sales tax statute, it only applied to transactions of tangible personal property, the goods sector. 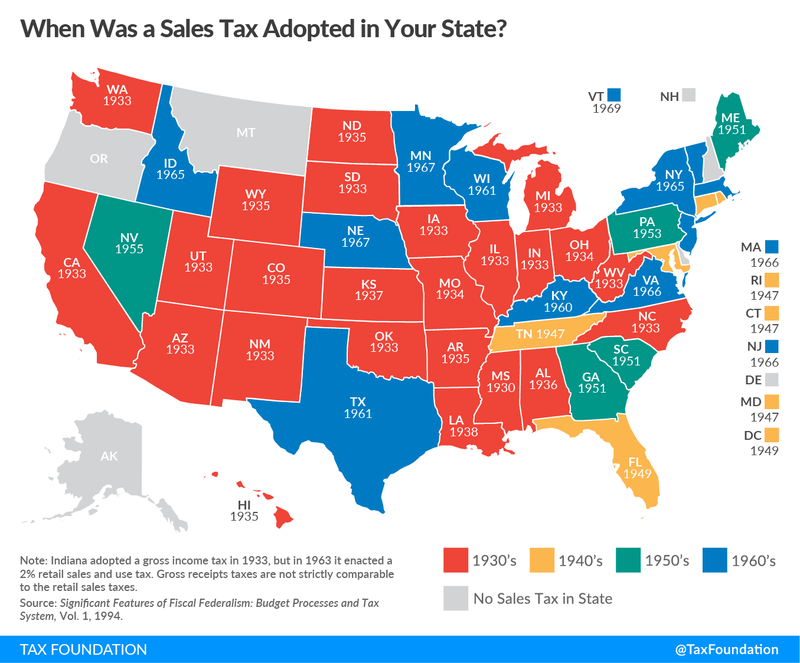 Forty-four states and D.C. followed Mississippi in enacting sales taxes in the following decades, and all but three (Hawaii, New Mexico, and South Dakota) for the most part adopted a goods-only tax structure. Some states have moved in this direction relatively recently, but none in a comprehensive way that changes the default treatment of services. Most states still have a default of taxing all goods unless they have an enumerated exemption, and a default of taxing no services unless they are enumerated as taxable. Frequently, it is argued that since some goods are “necessities,” they should be sales tax-free. In most cases this manifests itself as exemptions for particular goods like groceries, clothing, and medication. These exemptions, while well-intentioned, have the effect of significantly narrowing the tax base, as groceries, clothing, and medication make up a large percentage of consumption, with groceries and clothing alone making up 10 percent of personal consumption expenditures in 2016, according to the Bureau of Economic Analysis. 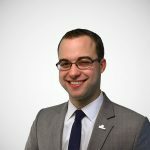 While many argue that these exemptions are necessary to protect low-income individuals, these exemptions of course are enjoyed by anyone purchasing these products, even high-income individuals. A better, more targeted solution is to include these products in the sales tax with the interest of maintaining a broad tax base at heart, and then providing targeted relief to low-income individuals either through a credit on their income tax return, or through spending programs. Note: States with no sales tax (DE, MT, NH, and OR) are listed as “not applicable” (n.a.) within Table 17. Alaska has a local option sales tax. Source: 2017 State Business Tax Climate Index. While the previous two problems deal with the sales tax base being too narrow, this last one is an area where the sales tax base can be overly broad, taxing transactions that are not final consumption. In the process of making final goods and services, businesses will often buy raw materials from each other to create products. These business inputs, or business-to-business transactions, are not final consumption, and so should not be taxed by the sales tax. When states do tax business inputs, the costs of those taxes cascade, or “pyramid” down the production chain and embed themselves in the final price of the consumer product. Consumers end up paying the tax in the form of higher prices — they just do so in a nontransparent way. 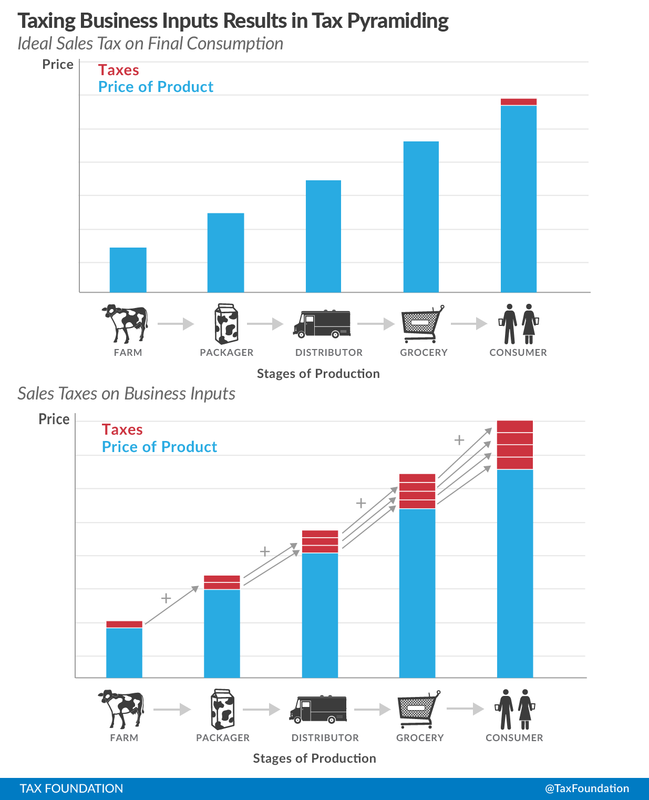 The picture below shows how a carton of milk could be taxed multiple times throughout its production chain if business to business taxes are applied. Taxing business inputs disproportionately harms industries with long production chains, and consequently can encourage vertical integration for tax reasons even if it makes no business sense. If states were to fix these three problems, they would have not only a broad-based but a “right-sized” sales tax system that taxes each dollar of consumption once and only once. This would result in stable revenue, and would allow for a low rate that brings in ample funding for government services. For more on your state’s sales tax base, see the tables in the back of our latest State Business Tax Climate Index.